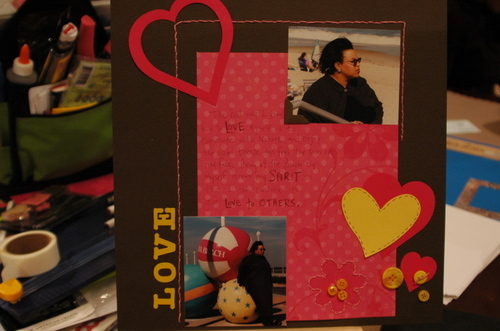 I've made some really great friends and met some fascinating and inspiring women through scrapbooking. Please pray for one of my scrap buddies, she's a mother of 7 and had three aneurysms last week. Praise God she's still with us, but still in ICU. 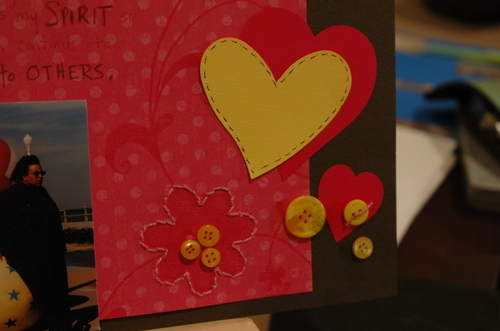 I made this card and prayed for her while making it. She gave me the african fabric scraps as a gift...she makes the most beautiful quilts which I have photos of...but have spent a week hunting through my 60,000 digital photos. When I find them...and I will, I'll post them. Stamp image is by Erika, designer and manufacturer from Michigan. Here's a close up of something you will probably never see again on my pages...hand stitching...cute but way to time consuming...watch for a tutorial on this from me via my NEW newsletter...sign up in the box in my sidebar..plans are to do 6-12 newsletters for 2008. Oh and by the way, that's faux stitching on the yellow heart.